Crete has seduced archaeologists for more than a century, luring them to its rocky shores with fantastic tales of legendary kings, cunning deities, and mythical creatures. The largest of the Greek islands, Crete was the land of the Minoans (3100-1050 B.C. ), a Bronze Age civilization named after its first ruler, King Minos, the “master of the seas” who is said to have rid the waters of pirates. According to Thucydides, he also established the first thalassocracy, or maritime empire. The Minoans were renowned for their seafaring prowess, which opened trade routes with the powerful kingdoms of Egypt, Anatolia, and the Levant. Depictions of ships abound on Minoan seals and frescoes. They are detailed enough to show that the vessels were impressive: generally, they had 15 oars on each side and square sails, and were probably about 50 feet long. 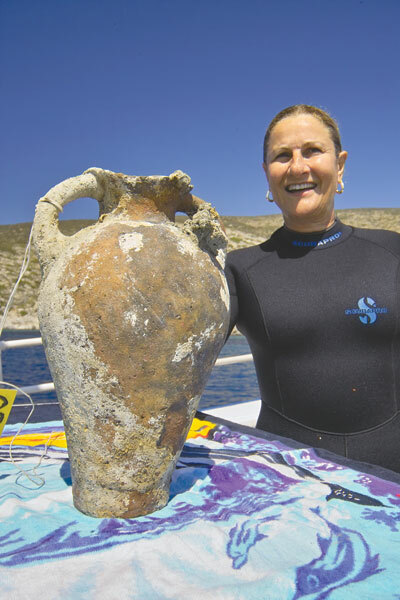 But little more was known about actual Minoan seafaring–until Greek archaeologist Elpida Hadjidaki became the first to discover a Minoan shipwreck. For nearly a month, she and a team of three sponge and coral divers aboard a 20-foot-long wooden fishing boat trolled up and down the island’s shores. Together with George Athanasakis of Athens Polytechnic University, they used side-scanning sonar and detected some 20 “targets,” or anomalies, that Hadjidaki sent her divers to investigate, often reaching depths of 400 feet. One by one, they turned out to be a depressing array of natural geological formations and portions of the seafloor ripped up by the nets of deep-sea trawlers, as well as a World War II airplane, a 19th-century shipwreck, and several pairs of shoes. Intrigued, Hadjidaki and the team headed to a spot about 300 feet off Pseira, near where Cousteau had been. “I thought, why don’t I go there and check it out myself?” she recalls. “But I said, I’m not going to go where Jacques Cousteau dived. I’m going to go to the deeper part.” First, she asked team member Giorgos Klontzas to venture down. Hadjidaki anxiously prepared to wait on the boat for five hours, the average total time of a single dive plus stops to decompress. But Klontzas returned only half an hour later. “He came up with his hands full of ancient pots,” she beams. “And he said to me, ‘There’s a whole world of them down there.’ So I jumped into the sea and said, ‘Let’s go!’ “Sure enough, cups, jugs, and amphoras lined the seafloor, and over the next couple of days the team brought several more samples to the surface. 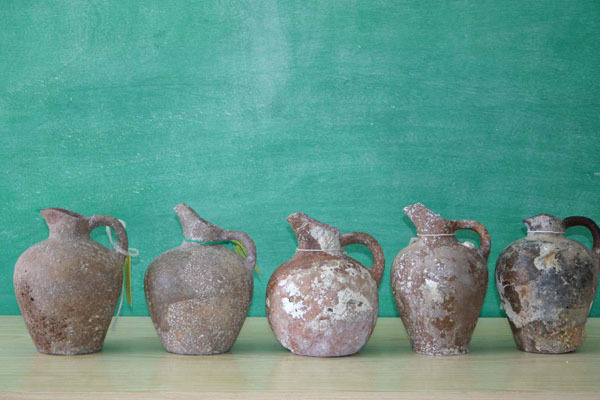 To date, Hadjidaki’s team has raised some 209 ceramic vessels, about 80 of which are nearly whole and clearly identifiable as types of amphoras and large jars that would have transported liquids, possibly wine and olive oil, though no residues remain. A handful of artifacts, including cooking pots, jugs, a few cups, and fishing weights, likely belonged to the ship’s crew. 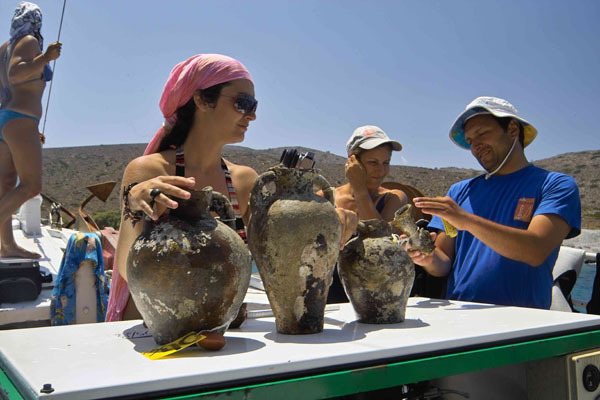 Philip Betancourt, a Minoan pottery expert who codirected excavations at Pseira from 1986 to 1996, has examined the finds from the site. 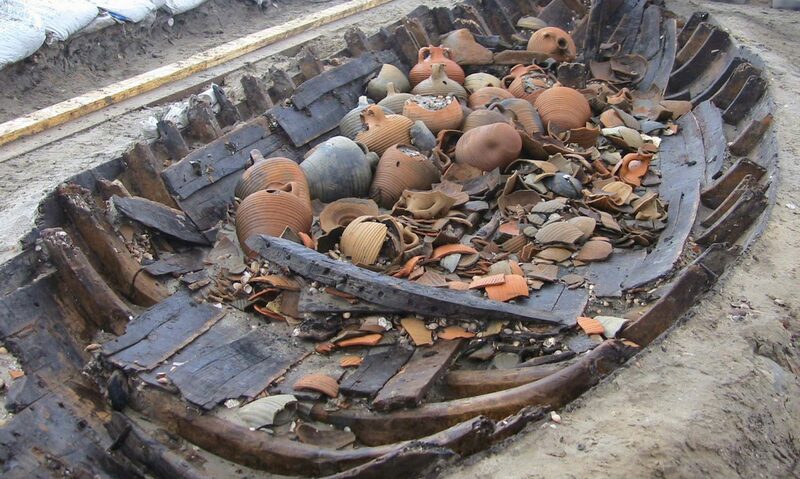 Even though no wood from the ship survives, he is convinced they belong to a wreck because they are an unusually large group of ceramic vessels that all date to the same period (Middle Minoan IIB, 1800-1700/1675 B.C.) and were all made on east Crete. “One doesn’t get an assemblage like that,” he says, “except from a very specialized context–in this case, a shipwreck.” Furthermore, the pottery that was still in place was found upside down, which seems to indicate the ship completely capsized and wound up with the hull uppermost and the cargo down. “This may help explain why no wood was preserved,” he says. 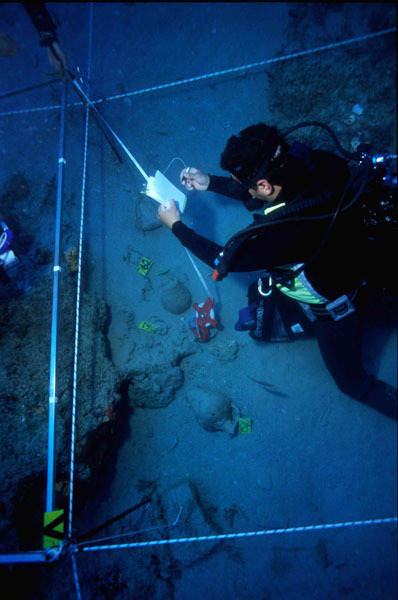 Hadjidaki has closely studied the arrangement of the finds, working with team architect Dimitri Timologos who drew underwater maps based on the artifacts’ location. 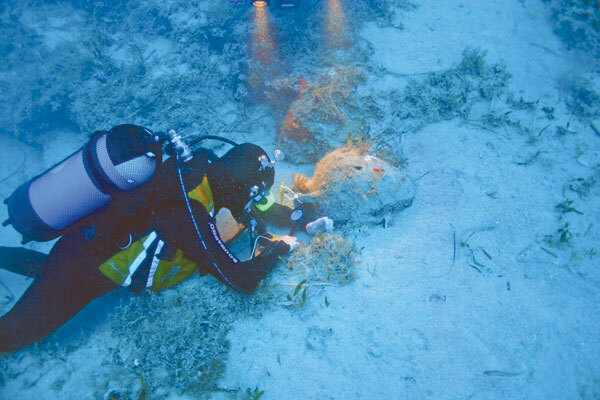 On the maps, she can trace a narrow trail of pottery about 100 feet long at the northern end of the wreck, where she believes the ship started to founder. The trail broadens into a roughly oval-shaped concentration that extends over an area 50 by 65 feet, from which she estimates–by the distribution of objects–the ship to have been between 32 and 50 feet long. Hadjidaki thinks it was similar to, but larger than, one depicted on a serpentinite seal stone excavated at Pseira in 1991. 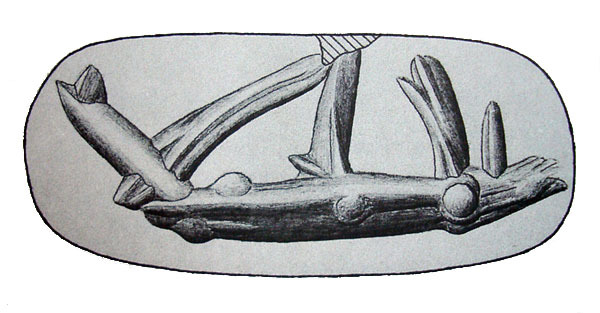 It shows a ship with a beak-shaped prow, high stern, and single mast connected to the vessel by ropes (but no oars, as in earlier representations of Minoan ships). Marine archaeologists in Sweden have discovered what they believe to be the wreck of a Viking ship at the bottom the country’s largest lake. “Never before has a Viking shipwreck been found in Swedish waters,” marine archaeologist Roland Peterson from the Vänern Museum told The Local. One of the ship’s ribs was discovered protruding from the bottom of the lake, while the rest of the boat was filled with a one metre-thick layer of sediment. “We can’t be sure of anything until we get the dating results back, which could take around a month. But the sword did seem semi-familiar,” said Peterson, referring to the weapon’s apparent similarity to earlier Viking era finds. 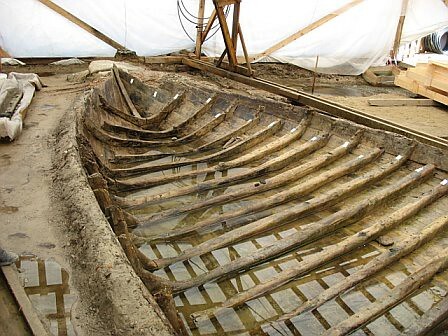 The ship’s clinker-built structure also strengthened the hypothesis that the vessel found in the Lurö archipelago, in the middle of Lake Vänern, dates from the Viking era. Vänern is Europe’s third largest lake, with an area measuring 5,648 square kilometres. The Swedish coastguard and the Vänern Museum are currently involved in a joint project to discover and examine shipwrecks lodged at the bottom the vast lake. Six other wrecks have also been discovered within a 100 metre radius, three of which were found lying almost on top of each other. “But it’s too early to say whether these date from the same era,” said Peterson.